The term “leaf miner” is a common name for a type of pest actually lives inside the tissue of the leaf. These bugs mine through the leaf eating the best parts, and leave a trail of damage behind. A “leaf miner” is not actually a species of bug – it is a generic term for the larva/babies of any bugs that live inside leaves and tunnel them to eat (including some moths, sawflies, flies and beetles). 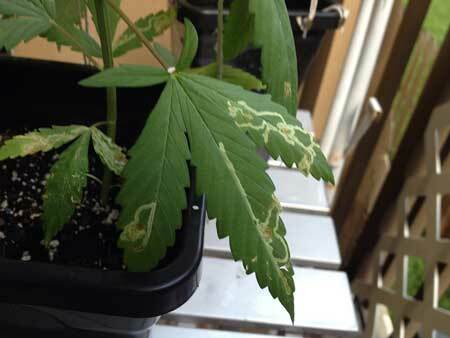 Although different types of leaf miners come from different bug parents, the leaf markings look very similar. The lines left on the leaves of your cannabis plants are the the main symptom of leaf miners. Since the insects live inside the leaves themselves you likely won’t see them. Now that you know what the damage from a leaf miner looks like on your marijuana leaves, learn how to get rid of them for good! This won’t fix the problem but since the bugs are actually living inside the leaves you are killing them alongside the leaf they’ve infected. If you don’t want to remove the whole leaf, you can crush the larva by pressing your fingers together where you see a trail. Spinosad Products (safe & organic) – Spinosad products are organic and completely harmless to pets, children, and plants. Spinosad products can be used directly to kill leaf miners by ingestion and should be sprayed liberally anywhere you see leaf miner damage. Although depending on what your “parent” bug is, Spinosad may not be as effective as other treatments, it does work and it’s very safe for plants, animals and humans! Spinosad is an organic insecticide made from the fermentation of a specific soil bacteria (actinomycete Saccharopolyspora spinosa) and kills leaf miners via ingestion or contact by affecting the insect’s nervous system. 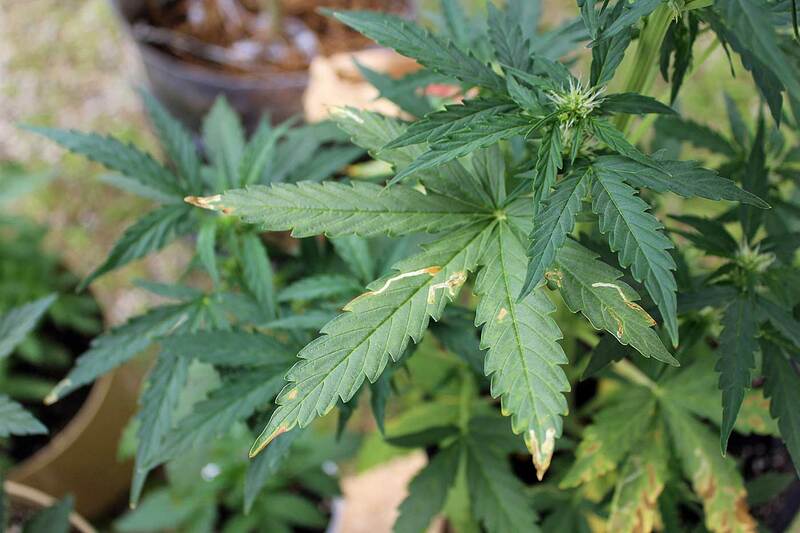 Spinosad can be a good choice for organic and outdoor growers, because it is very toxic to leaf miners, but is less toxic to many beneficial insects, bug predators and spiders. You will need a mister (also called a “One-Hand Pressure Sprayer”) to cover all the leaves evenly when spraying them with spinosad products. 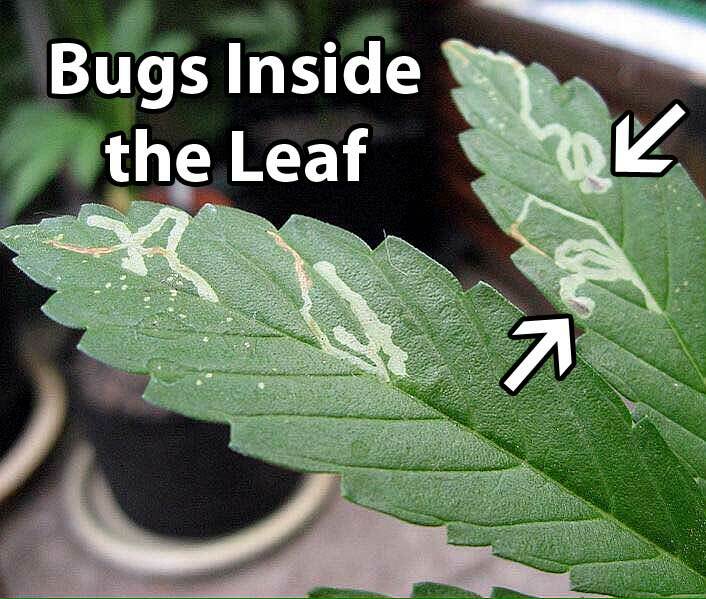 Make sure especially to get any leaves with markings/trails, as it will kill the larva living inside the leaf. Neem Oil will leave an unpleasant taste/smell on buds when used to treat flowering plants, so don’t let this stuff get near your buds! There’s also some evidence Neem oil may be harmful to humans so use with care! That being said, Neem oil is an all-natural remedy that is very effective against many different types of bugs and mold, including pretty much all leaf miners. You will need a mister (also called a “One-Hand Pressure Sprayer”) to spray all the leaves evenly, since neem oil and water can separate easily. Some types of moths lays eggs that hatch into leaf-tunneling larva before turning into caterpillars and eventually becoming a moth. If you see evidence of moths or caterpillars on your plants (for example something is also munching on your leaves, you see little black droppings, or you catch a worm in the act) in conjunction with leaf miner damage, get BT spray immediately. This biological insecticide contains the bacillus thuringiensis (BT) bacteria which kills larva and prevents caterpillars from being able to eat. This is one of the most effective ways to kill caterpillars and larva without hurting beneficial insects. 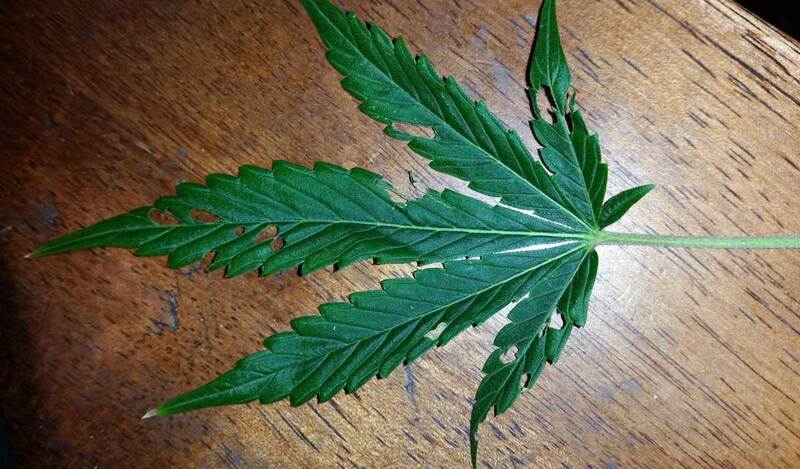 As a bonus, it also kills other cannabis pests like fungus gnats and worms. Apply a caterpillar BT spray as soon as you see leaf miner damage combined with caterpillars or caterpillar poop. If in addition to leafminer damage you also see damage like this on the plant where big chunks of leaves are missing, it’s a sign your leaf miners might actually be caterpillar larva. In that case make sure to use BT spray in addition to any treatments for the leaf miners in particular! If the BT spray has no effect after a couple of days, it’s a big sign this could be a different type of bug as BT spray is very effective at killing young caterpillars and moth larva. If it does seem to help, repeat your treatment every week for as long as you’re still seeing caterpillars or leaf miner damage (though you can give BT more often if there’s a heavy infestation). Make sure to thoroughly mist both the tops and bottoms of leaves, and apply again after a heavy rain (since that will wash the BT away). Since BT is harmless to humans, you can use BT products up to the day of harvest! One thing to keep in mind is BT spray almost instantly stops caterpillars from being able to eat, but doesn’t kill them directly. So although you may see the caterpillars alive and apparently unharmed after spraying, the BT is still doing its dirty work. These may not be the best choice for all cannabis growers, but these are very cheap and effective against leaf miners because it physically prevents moths, flies and beetles from getting to your plants, while still letting light in. You can also water your plants through the netting. These are sometimes used to make mini “green houses” on the plants, or some grower will just drap them over the plant as they’re so light and airy they don’t really bother the plant. The one downside is these are much easier to use and are more effective with smaller plants. It becomes difficult to fully cover larger plants. However, for young plants these can be great! They also protect your plant from wind and some harsh conditions.